Can I prevent Google Play Store from using my data? 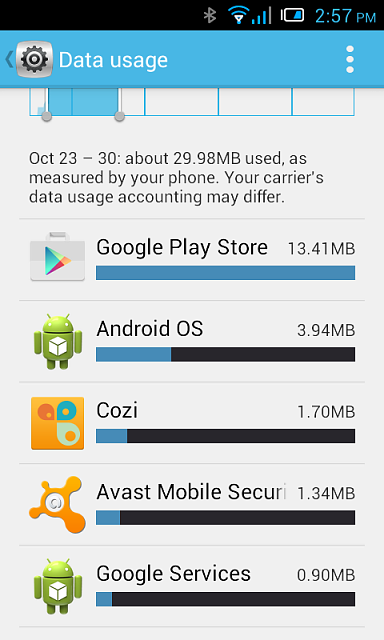 As you can see from the screenshot, Google Play Store is using most of my of data. I'm on the Ultra Mobile $20/mo UT&T plan that offers only 100MB of data. That would be more than enough for Google Voice , Google Calendar and Cozi, which are the only apps I use. But even though I have Google Play Store set to auto-update apps over Wi-Fi only, it's using up more data than all the others combined. Are there any tweaks I can do to prevent Google Play Store from burning up my data? I can purchase more data at $5 for 500MB if I have to, so even if Google Play Store puts me over the limit, it's not a problem. But I would like to avoid it if possible. If you tap on Google Play Store it should take you to a detailed report. At the bottom of that report, there's a box that says Restrict Background Data. Check that and the Store will not use data UNLESS you open the app. Why is Google Search Constantly Crashing in the background?